As a new or prospective iguana owner, you likely know that iguanas are vegetarians (folivores or leaf eaters, to be precise). In order to maintain his health, your iguana should primarily be fed a diet of dark, leafy greens such as Swiss chard, endive and collard greens. You may not be aware, however, that several herbs are a nutritious and tasty addition to your pet lizard's diet. Alfalfa and dandelions top the list. Iguanas need protein from plant sources -- not animal -- and alfalfa packs a protein punch. 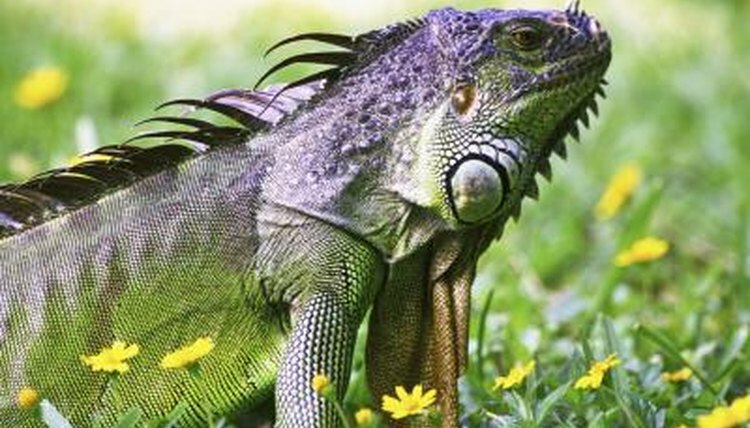 In fact, experts at the Green Iguana Society consider it a staple in your iguana's diet. You may feed alfalfa tablets or powder, made for human consumption, to your iguana. Alfalfa greens are found in grocery stores or in the wild where they can be foraged for free. You can also grow alfalfa yourself since it tolerates a wide range of environmental conditions. Dandelions might be an eyesore in your backyard, but they are a delightful, calcium-dense food for your iguana. Plus, dandelions don't cost you a thing. After harvesting, pick off dead blooms and rinse thoroughly to remove dirt and potential pesticides (including cast-off chemicals from your neighbors' yards). Feed the leaves and flowers, but flowers should be given as a treat only. Remove or finely chop the stems. You may need to cut dandelion leaves and flowers into fine pieces for juvenile and baby iguanas. Fresh parsley is one of the most readily available herbs you can buy for your iguana's dinner. A popular flavoring herb and garnish, it's available in grocery stores year-round. This antioxidant- and calcium-rich herb can also be grown at home in an outdoor garden or indoor container. Feed parsley to your iguana as an occasional treat, since it is high in oxalates that can prevent the absorption of calcium and other minerals that your iguana needs. Cilantro, also known as Chinese parsley, is another tasty addition to your iguana's diet. You can grow this herb at home each year and harvest it before the seeds appear. Offer cilantro to your iguana as a treat only since it is also high in oxalates. Herbs are a healthy source of food for your pet iguana. Most will relish the opportunity to eat them, although some herbs should only be fed occasionally. To ensure that your pet iguana gets the well-balanced diet he needs to thrive, feed him a daily salad containing a variety of freshly washed dark greens -- including an herb or two. Check with an experienced reptilian veterinarian if you are in doubt about how much or how often to feed herbs to your iguana.